Getting your children to brush their teeth isn’t always easy. 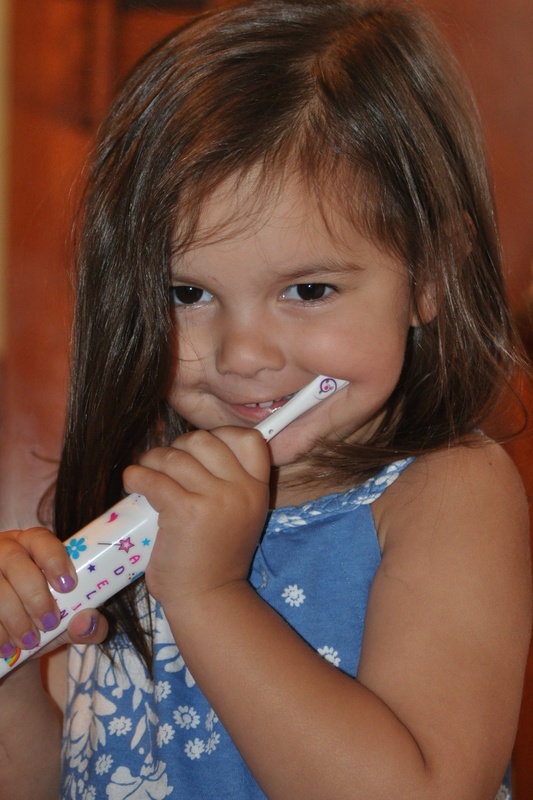 I am happy to say that I have found a toothbrush that makes Adeline want to brush her teeth…all the time! Actually she’s constantly asking to brush her teeth and it’s getting a little crazy! I guess it is better than the alternative. Arm and Hammer sent us a Kid’s “My Way” Spinbrush to review. The Spinbrush is a battery operated toothbrush that comes with over 140 stickers including letters, princess themed, animals, fun phrases, rock star and whimsical designs (rainbows and flowers). The on and off button is a large pink gem that match the pink bristles and battery cap. Adeline had so much fun decorating her toothbrush. We wrote her name and, of course, she had to put a guitar on first. After covering most of the toothbrush with stickers, Adeline was ready to try it out. I wasn’t sure how she would feel about an electric toothbrush, but she loved it. It has a small head for children aged 3-8 and retails for $6.99. Adeline brushed longer than she normally does (I actually have to tell her to stop) and I really felt that she was able to do a great job on her own. According to Arm and Hammer kids brush 38% longer with a Spinbrush battery powered toothbrush than with a manual brush. You can check out the entire line of Spinbrushes here: http://www.spinbrush.com/Kids_MyWay.html. I would highly recommend picking up one of these super cute toothbrushes for that special child in your life. * We did not receive monetary compensation for this review. Erika did receive the toothbrush mentioned in this post to facilitate this review. This will in no way sway our opinion of the product or service. The review is in our own words and is our opinion. Your results and opinions may differ. Both of my girls have spinbrushes and we love them! My girls would go nuts over this one though. Such a great idea to allow kids to customize their own toothbrush..thanks for sharing!